Ultimaker PP (Polypropylene) is durable. It has high toughness, exceptional fatigue resistance, and low friction. It also has good chemical, temperature, and electrical resistance. PP is one of the most widely used plastics on the planet. Ultimaker PP (Polypropylene) is durable. It has high toughness, exceptional fatigue resistance, and low friction. It also has good chemical, temperature, and electrical resistance. PP is one of the most widely used plastics on the planet. From electrical components to living hinges, PP is the go-to material for prototyping and end-use products. Ultimaker PP is a good choice for printing low-friction end-use parts that have good fatigue resistance and toughness. When printing using one of our extensively tested Ultimaker Cura profiles for Ultimaker 2+ or Ultimaker 3, you get reliable results and a seamless 3D printing experience. Smells like wood, looks like wood, feels like wood! ABS (Acrylonitrile Butadiene Styrene) – the second most used 3D printing material. ABS is strong, flexible with a high-temperature resistance. It is particularly suitable for tools, toys and all kinds of utensils. Innofil is our best value ABS. 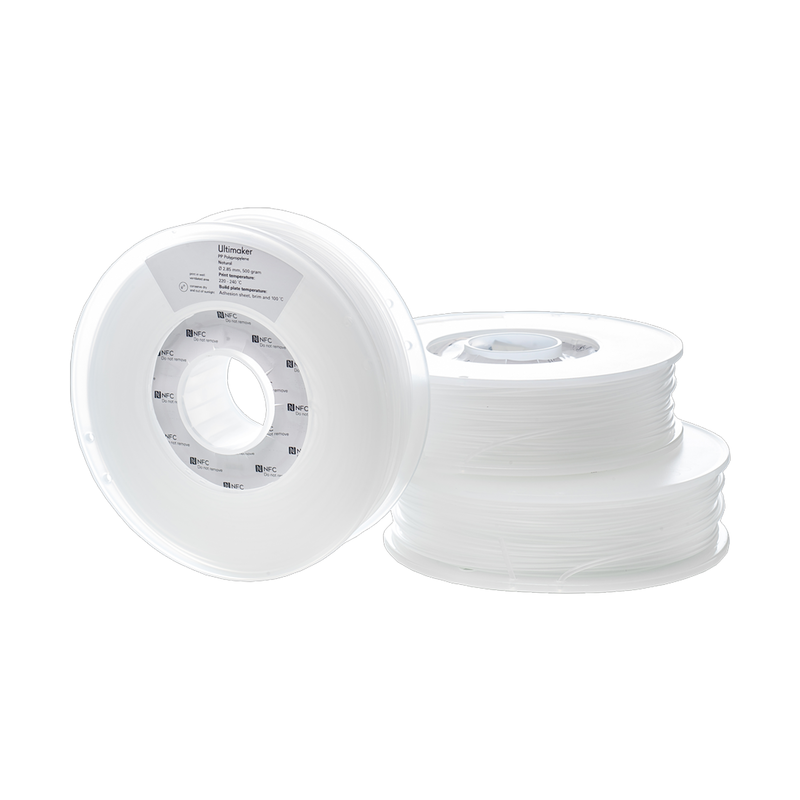 TPU 95A (thermoplastic polyurethane) filament is a semi-flexible and chemical resistant filament with strong layer bonding, designed for 3D printing consistency. It is the go-to choice for a wide array of manufacturing projects that demand the qualities of both rubber and plastic. Ultimaker PC (polycarbonate) filament can print strong and tough parts that retain dimensional stability when subjected to temperatures as high as 110ºC. PC is a perfect filament for printing moulds, tools and functional prototypes.